Home › Fix My Smile › Why Are Dental Implants Better Than Dentures? For as long as people have been losing their teeth, they’ve found the means of replacing them in the form of dentures. Everyone can vividly imagine George Washington with his wooden dentures, or even the more familiar image of a grandparent’s acrylic dentures resting in a glass of water overnight. While dentures used to be a completely serviceable means of replacing missing teeth, advances in restorative dentistry have left us with a far superior treatment. Dental implants are the most modern, effective, and permanent means of replacing missing or failing teeth, and this option is far better than dentures. 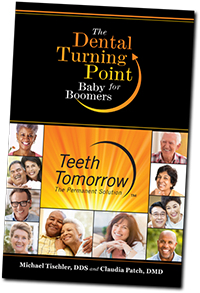 Most Baby Boomers have not had the chance to visit a dentist anytime after colossal strides were made in the field. For most, the only treatments they’re familiar with are often outdated and ineffective, and new treatments seem alien and suspicious to them. Many are left to wonder why dental implants are supposedly better than dentures. The revolutionary Teeth Tomorrow® Prettau® Zirconia full-arch dental implant bridge truly proves that dental implants are a far better choice for replacing missing or failing teeth than dentures. Every Teeth Tomorrow® permanent bridge provided exclusively by Tischler & Patch Dental is composed of a remarkable material known as Prettau® Zirconia. Each bridge is custom milled to your exact smile specifications, from a solid block of Prettau® Zirconia, allowing it to avoid the structural weaknesses that come from joining multiple materials together. The result is a full-arch implant that naturally resembles a full mouth of beautiful, healthy teeth. Traditional acrylic dentures are notoriously fragile and are prone to chipping and breaking, even from normal everyday activities like talking or eating. Acrylic dentures are also porous and capable of attracting plaque and other oral bacteria, in addition to staining easily as well. Your Teeth Tomorrow® Prettau® Zirconia implant bridge will be naturally resistant to stains and other harmful bacteria, won’t attract odors, and will withstand all chips and breaks. Best of all, it will remain flexible enough to feel just as comfortable as your natural smile and bite, so you can enjoy all your favorite foods with ease and peace of mind again! A brighter today begins with Teeth Tomorrow®, contact Dr. Michael Tischler today to schedule your initial consultation!